On April 9, after having resisted participation in the contest for two years, senior engineering major Omari Faakye became “Mr. 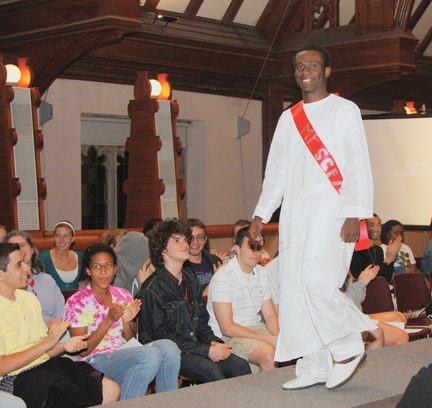 Swarthmore 2010.” Representing men’s soccer and the Swarthmore Christian Fellowship in this year’s contest—one of the best-attended events of Family and Friends Weekend—Faakye strolled the runway wearing traditional Ghanaian dress, performed a break-dance routine during the talent section of the competition, and answered two questions from the judges. The first, which asked for two words that described him, he answered with “smiley and bubbly.” And when asked to identify the most important person in his life, he named his mother as the driving force behind his academic achievements.